12-page Chair Caning Booklet, full color, step-by-step illustrated how-to's. Get this booklet when you're weaving a seat with drilled holes in frame. This is the same booklet that comes with our Chair Caning Kit. 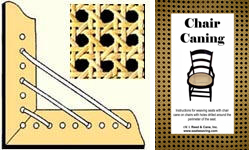 12-page Chair Caning Booklet, illustrated how-to's for successful chair caning. Get this basic booklet when you're weaving a seat with drilled holes in frame. This is the same booklet that comes with our Chair Caning Kit.